0444 - Boom (Alternate View) - Heroes Inc.Heroes Inc. Damn viper, you beat me for first post. Why is there an alternate view? I don’t recall seeing a main view. Or is this alternate to the explosion way back when? Yes there is its in 0244 – Boom! 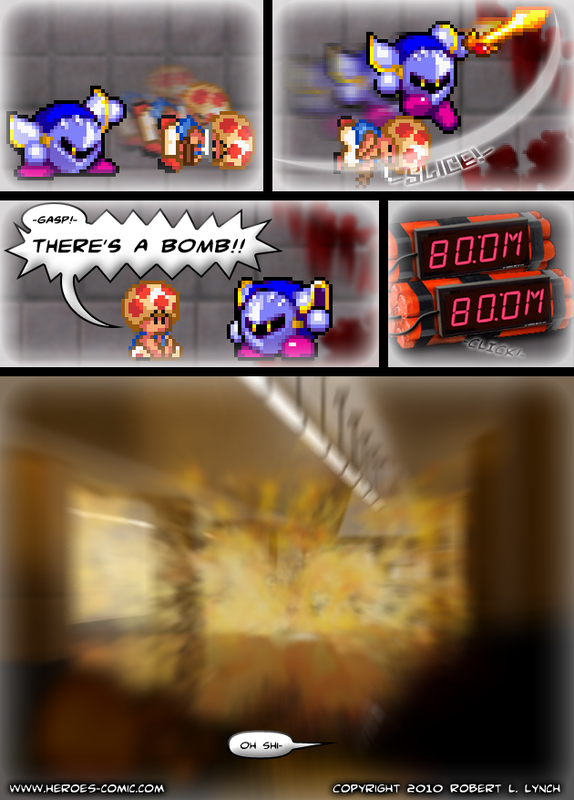 😀 I am so happy that the comic is back to what drew me in the first place; explosions! lol tvtyrant, nice comic by the way Robert. I have been waiting a while for this! 1. Hi! I’m Rob’s girlfriend. I moved in with him back in August. Sometimes I’m a distraction, like right now when I’m super sick and am quarantined to the apartment. Rob is my link to the outside world and the delicious tacos it can provide. 2. I try to help you guys out when I’m not hogging Rob. For instance…. 3. Did Rob mention the only internet access we have while at home comes from our phones? Well, yeah, so that makes timely updates a little more difficult. Plus his crappy lappy is crappy. 4. Rob is a human. Shocking, I know, but he bleeds and everything. So this means that he has a life outside of Heroes. He goes to work, pays bills, shops for easily microwaved foods, does laundry, etc. Okay, I’m done, I swear! Thank you guys for cyber-prodding Rob to do the stuff he loves. I’ll try to help you out on the real world end too. Wait Robs human?? I thought he was a computer for our amusement. Yeah… We should consider Rob more ”Human”. As for the updating on time, don’t worry. We’re very patient and understanding group here. I myself am reluctant to believe he really is human. At first I assumed robot, but then I began to operate on the theory that he is some sort of caffeine dependant cyborg. Now, having met his parents, who are certainly not the evil genius lab coat wearing types, I’m noticing human tendencies. Such as laziness, apathy, somewhat regular eating and bathing, laziness, and the sudden ability to do whatever I ask if I just remove enough clothing. I just thought I would throw this out there though, since I’ve been hogging him for the past few days, and potentially a few more. Don’t want torches and pitchforks on my account, you know. We don’t mind waiting. We understand Rob is human and has a life. If you remove all of it, he’ll probably end up fixing things that weren’t even broke. The post is so helpful for me,i like it very much,thank you! the installments for another loan, or affording university.